Retail sales are declining and many of the big retailers are in big trouble. The sub prime auto bubble is about to burst. Manufacturing is now declining. China announce a yuan clearing house with France and the UK will be issuing yuan denominated bonds in preparation for the yuan to be the world reserve currency. FBI facial recognition online. IMF in talks with West African nations to bail them out. Yemeni tribes cut off talks with government. Libyan tribes say they were hit but unidentified planes. Russia wants to help with the fight against terrorism. President Obama says if Syria strikes a US plane he will attack Syria. Reports the Yemen terrorist organizations are planning a terror attack on the US. Never waste a good crisis. While we already knew a major reason for The West chasing into Africa was to leverage its relatively low credit levels as the last bastion of Keynesian-stimulus-hope in the world(estimated at between $5 and $10 trillion in secured debt, using its extensive untapped resources as first-lien collateral). And so it is little surprise that, as The WSJ reports, The International Monetary Fund on Thursday warned the West African Ebola epidemic requires a “large scale” global intervention to control acrisis that is ravaging economies in the region. All three major Ebola-suffering countries were already in bailout programs ($200mm loan in 2012 for Guinea, $100mm loan for Sierra Leone, and $80mm credit facility for Liberia) but with the “world community taking forever to respond,” The IMF is happy to step in and secure some assets / lend over $100mm more to each nation to fill financing gaps. This post was published at Global Economic Analysis on September 15, 2014. Is This China’s Scariest Chart? As China’s shift to a consumer economy progresses based on the urbanization of its agrarian ‘poor’ population, an odd thing is happening at the other end of the demographic wealth spectrum. As WSJ reports, nearly half of wealthy Chinese are planning to move to another country within the next five years, according to a new Barclays survey. The top reasons 47% of these individuals – with net worths over $1.5 billion – cite for fleeing China include educational and employment opportunities, economic security, and climate. In what appears to be an awkward moment of uncomfortable fact, ABC reports satellite imagery reveals an area of about 20 million square kilometres covered by sea ice around the Antarctic continent – thehighest level of coverage since records began. This is the 3rd year in a row that the sea ice coverage has reached a record level – increasing at 1.5% each decade since 1979. However, there is another side to this, as the area covered in sea ice expands scientists have said the ice on the continent of Antarctica which is not over the ocean continues to deplete. While Janet Yellen and her band of money printers work themselves into a tizzy over whether two buzz words – -‘considerable time’ – – should be dropped from their post-meeting word cloud, they might be better advised to just read the newspapers. This morning’s WSJ brings word that the lending boom which our monetary central planners are eager to stimulate is apparently off-to-the-races. Well, sort of. The item in question is a $122 billion globally syndicated loan to facilitate an M&A deal between the world’s two largest beer companies – AB InBev with a 20% global market share and SABMiller with 10%. Needless to say, the only possible reason for creating a monstrosity with $60 billion in sales spread among scores of highly differentiated regional and national beer markets is the ‘synergy’ euphemism – -that is, the ‘savings’ from thousands of job terminations especially in those two paragons of job growth known as North America and Europe. So the purpose is self-evidently the opposite of the Fed’s intent – whether the sweeping job cuts which Wall Street will peddle to justify the deal actually happen or not. In any event, the deal has virtually nothing to do with real market economics. Both companies are already giant M&A roll-ups representing a string of mergers that have been going on for two decades, including the $52 billion InBev purchase of Anheuser-Busch six years ago. But you don’t have to be an expert in the beer industry to realize that these rollups were mainly the product of cheap debt and financialization, not free market economics. Recall that the beer industry ran out of true economies of scale 30 years ago when world class breweries reached their maximum efficient size in terms of production and distribution. This post was published at David Stockmans Contra Corner on September 15, 2014. The precious metals futures on the Comex were struggling most of the day, with both gold and silver ending just a little higher. The Comex warehouse activity is not worth mentioning. Gold is moving from West to East. China is clearly executing some longer term plan with regard to gold and its own fiat money as a reserve currency. This post was published at Jesses Crossroads Cafe on 15 SEPTEMBER 2014. SLV : today we had a huge rise in silver inventory at the SLV/inventory of 3.354 million oz/ rests at 339.486 million oz . Ladies and Gentlemen. It is impossible to obtain the massive amount of silver in such a short period of time.is storing nothing put paper silver. It could only mean one thing: that the massive longs on the comex is sovereign China holding these open interests through proxies. As I have explained to you in the past, it is my belief that China entered a deal with the west by loaning their hoard of between 300 – 600 million oz. Generally this would have been done by a lease arrangement for 10 years. The USA ran out of silver in 2003 so, as Bill Holter states…fill in the dots. China wants its silver back and is also very happy to receive copious amounts of gold at low prices. This is the reason why the CFTC remains mum on the silver/gold probe. Bill Holter goes in depth on this issue with his commentary tonight. This post was published at Harvey Organ on September 15, 2014. It appears today’s weakness in stocks (most notably high-beta momo) and bonds (HY credit weakness) was triggered by two “ma”s – grandma Yellen and grand-poohbah BABA’s Ma. Hawkish FOMC concerns took the shine off HY credit (and stocks) but Treasury bonds rallied modestly (5Y -3bps, 10Y -2bps). However, high-beta momo stocks dragged Nasdaq and Russell lower as ‘smart money’ proclaimed this was making room for the Alibaba IPO (which raises the question – if there is so much pent-up demand money on the sidelines just dying to be lost in the stock market, then why were so many high-beta, high-growth, momo names being sold today, theoretically in order to make room for the BABA IPO?) The USDollar ended marginally higher (GBP weakness, EUR strength) but most commodities gained on the day (Copper down on China) with WTI back to $93. Stocks did have a mini-melt-up on absolutely no news whatsoever into the last hour but gave most back. The Russell 2000 is -0.5% in 2014. It’s no secret the rich are getting richer, and the poor poorer. Accounts of this worsening condition are stroon across mainstream media and alternative news sources alike, albeit with somewhat different storylines. 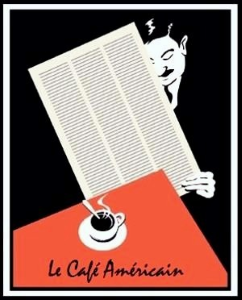 Although increasingly recognizing the importance of this issue, mainstreamers, who both cater to and are controlled by the status quo, portray the condition as a result of race and education differences (which is true), and that these shortfalls should be addressed via public policy (which is not true). And by doing so, they avoid discussing the more profound problem, and the real culprits in this regard, for whom they (think they) are obliged for a living. Here we are talking about the greedy bastards at the very top, like Warren Buffet and Bill Gates, who will do anything, including the hollowing out of the larger economy (think off-shoring, debt enslavement, destruction of the middleclass, etc. ), to stay there. In the movieElysium, it was no secret that there was the very rich, and everybody else. However today, this growing reality still escapes most, not that it will matter soon. Because today’s modern empires are built on thrones of debt, meaning they are destined for the same destruction of the surfs in good time. Of course in the meantime they are going to get as much as they can, and if they have robots to control the populations at some point (through fear if not reality), there’s no telling how far the atrocities will extend. First they will use them on foreigners in the larger war machine as justification for their creation, then on us like all the other surplus hardware / ordinance being employed to control the public by increasinglymilitarized police departments across America. Think it’s bad your liberties have been eroded? They are already killing anybody who steps out of line, with over 400 police shootings per year in the US now the norm apparently, where the robots could be used to do the things humans would object to. Obviously we are years away from this kind of thing, but if the technology were there, based on the way things are going, and in knowing whom we are dealing with, one would be foolish to discount such an outcome completely. 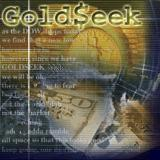 This post was published at GoldSeek on 15 September 2014. Techs were struggling most of the day, as the SP 500 showed some futures driven resilience. The Empire Manufacturing number came in high side, but the actual Industrial Production came in negative, with last month being revised in half. Go figure. There will be an FOMC decision on Wednesday. With the Alibaba IPO in play, I don’t think we will see the markets fall appreciably unless there is a serious break in the geopolitical stability. In 1975-76 the Dow/Gold Ratio rebounded yet the economic problems were not fixed – just the same as we see today. The real decline in the Dow/Gold Ratio should be in front of us as the Dow falls into deflation of wealth and gold rises into inflation of fiat. 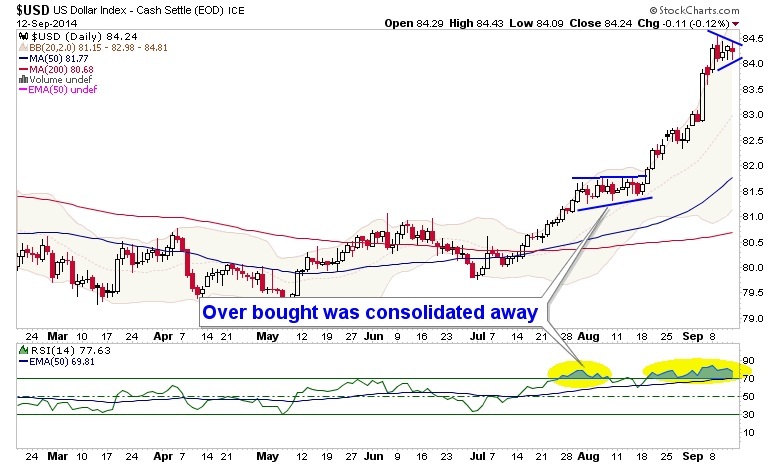 This post was published at Gold Broker on Sep 15, 2014. Gold climbed up to $1238.25 by a little before 8AM EST before it drifted back lower in early New York trade, but it still ended with a gain of 0.26%. Silver rose to as high as $18.70 and ended with a gain of 0.16%. Euro gold climbed back over 953, platinum lost $6 to $1359, and copper fell slightly to about $3.09. Back in 2012 we accurately predicted that in the Brave New Normal World, where zero cost debt-issuance is used to immediately fund stock buybacks instead of being reinvested in growth and expansion, in the process boosting management pay through equity-performance linked option payout structures, that with every passing year CapEx spending would decline first in relative then in absolute terms, even as free cash flow use of funds is spent on other “here-and-now” shareholder-friendly activities such as buybacks and dividends would grow exponentially (which also explains the unprecedented emergence of shareholder “activists” who demand that in an Ex-CapEx world they get paid right here, right now). Using the standard weekly currency chart we followed along for months as the Euro found resistance at the long-term downtrend line as expected, the commodity currencies long ago lost major support and non-confirmed the commodity complex and the US dollar moved from a hold of critical support, to a trend line breakout, to its current impulsive and over bought status. It is time now for a closer look at Uncle Buck since this reserve currency is key to so many asset markets the world over. As the charts below show, USD is over bought on both daily and weekly time frames. But the monthly is interesting because its big picture view is that of a basing/bottoming pattern, and it is bullish. That is a long-term director, so regardless of what happens in the short-term, a process of unwinding the hyper-inflationist ‘Dollar Collapse’ cult is ongoing. Signs point to disinflation toward deflation. We’ll start with a daily chart and then ascend right through the weekly and then the monthly to take the pulse of USD. This post was published at Gold-Eagle on September 15, 2014.